By following a few simple steps, your Xbox 360 can change back from storefront to videogame console. 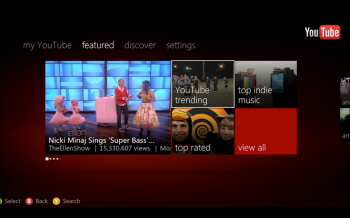 The new Xbox 360 "Metro" dashboard design released last week to a mixed response from the gaming community. While some appreciate the new, sleeker aesthetic, others feel bogged down by the ratio of whiz-bang to function. One of the most prominent additions making some uncomfortable are the newly emphasized advertisements, but thankfully, a dedicated group of network tweakers have figured out the key to making them disappear for good. The trick comes from blocking the solitary server delivering ad content to the console: rad.msn.com. Figure out how to plug that pipe, and suddenly your dashboard stops trying to convince you that Ashton Kutcher's new movie is actually worth ninety minutes of your time. There are a few ways to do it, but the easiest is to simply block the connection directly from your router. Most routers use different interfaces, so you'll need to either be knowledgeable on the subject or have the ability to type something into Google in order to proceed. Once you've done it, there's a simple test to see if it worked (other than firing up your Xbox, that is): Try to reach the server on a web browser. If it gives you a 404 error, congratulations! This is likely the first time you've been happy to see one. If it hits you with a 403, get back into that router and try again. 1. Sign up for a free OpenDNS account. 2. Add a network for your current IP address. 3. Go to Advanced Settings and next to 'Domain Typos', ensure 'Enable typo correction' is checked. 4. Go to Web Content Filtering settings and set the filtering level to 'None', and under 'Manage individual domains', put rad.msn.com and select 'Always block' and then click 'Add domain'. 5. On your Xbox, go to System Settings -> Network Settings -> (your connection) -> Configure Network -> DNS settings -> Manual, and enter the OpenDNS IP addresses for the primary and secondary DNS servers: 208.67.222.222 and 208.67.220.220. Today, gamers and tech junkies tend to think of ads as a subsidy, a fair, passive way to "pay" for enjoying free content. That being said, the Xbox 360 isn't free, and nor is its Xbox Live service, so I think it's a fair question for gamers to ask why they should be bothered by advertisements while poking around the service they're shelling out for. If the ads don't bug you, then great. If they do, now you've got a way to knock them out.